The IDM Mining Red Mountain Project exploration camp in the southern Golden Triangle region near Stewart, British Columbia. Photo by Ellsworth Dickson. 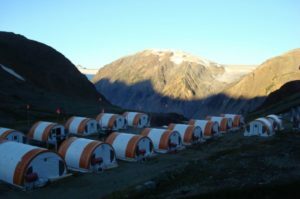 IDM Mining Ltd. [IDM-TSXV; IDMMF-OTCQB] said Tuesday October 9 that it has secured a provincial Environmental Assessment Certificate for its development stage Red Mountain gold project in northern British Columbia. IDM Mining shares advanced on the news, rising 8.3% or $0.005 to 6.5 cents on volume of 460,500. The 52-week range is 6 cents and 13.5 cents. “This is a significant step for the company and the realization of the potential of the Red Mountain gold project,” said IDM Chairman Michael McPhie. “With the successful completion of a rigorous process in a timely way, we have demonstrated the value and validity of our approach to project permitting, community engagement and project development,” he said. McPhie said the support of the Nisga’a Nation and other communities in northern B.C. made this possible. The company looks now looks forward to moving ahead with development in the near future, he said. IDM Mining is focused on advancing the Red Mountain Project towards production. The 17,125-hectare project is located in northwestern B.C., 15 km northeast of the mining town of Stewart. The project is located near a paved highway and grid power. Red Mountain hosts a NI 43-101 compliant estimated resource of 2.8 million tonnes in the measured and indicated category averaging 7.91 g/t gold and 22.75 g/t silver, for 704,600 ounces of gold and over two million ounces of silver. On top of that is an inferred resource of 316,000 tonnes, averaging 6.04 g/t gold and 7.61 g/t silver, for 61,400 ounces gold and 77,200 ounces of silver. The decision to grant the Environmental Assessment Certificate concludes a process that began in 2016 and provides a defined set of conditions and commitments that will allow for commercial development and operation of the project, IDM said. News that the certificate has been secured comes just days after the company announced details of a non-brokered private placement deal that aims to raise $4.1 million. The private placement will be comprised of flow-through shares priced at $0.07 per share and non-flow through units priced at $0.06 per share. Each common unit will consist of one common share in the company and one half of one non-transferable share purchase warrant, with each whole warrant entitling the holder to acquire one common share at $0.085 per common share for a period of 24 months following the closing date of the offering. Net proceeds will go towards exploration and development activities at Red Mountain, the company said in a press released on October 5, 2018. In a separate development, Sunvest Minerals Corp. [SSS-TSXV; OTC-SRKZF] is exploring on the Clone property, which covers 4,621 hectares and lies 16 km southwest of the Red Mountain gold project. Sunvest recently reported results from sampling of historic drill core from its Clone Project. The company said core assays returned 30.3 g/t gold over 4 metres and confirms the existence of multiple zones at the Clone property.